‘Part of the paramount experience of a farmers dinner is getting to meet your farmer|! !|’ says Keith Sarasin|! !| whose The Farmers dinner has community dinners using all locally sourced products. Keith Sarasin’s life journey in food service began at 14, with his first job at Red Lobster. 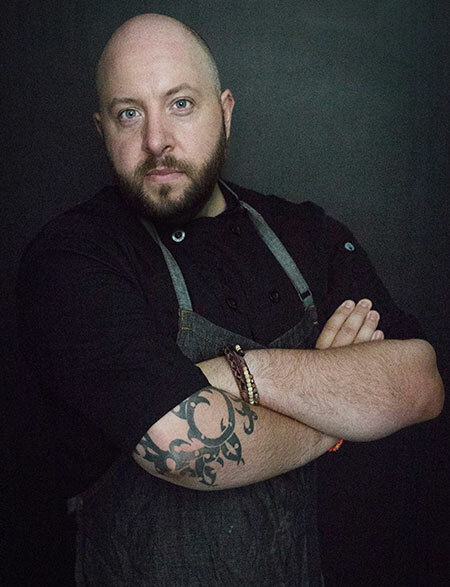 Today, at 35, the Nashua resident is founder and CEO of The Farmers Dinner, a business that exclusively presents community dinners, bringing New Hampshire farmers and chefs together, using all locally raised products from beans to brisket. Since 2012, The Farmers Dinner has fed thousands at nearly 40 dinners, in a dining revolution that has taken root across the country. Sarasin’s company gives a financial boost and visibility to New Hampshire’s small farms. Today he works with 31 growers, who, along with the chefs, meet their dining public at each farmers dinner. Q. What was your food background before starting The Farmers Dinner? A. Originally, my first food job ever was actually in the kitchen at 14 years old. I was washing dishes, and I just wanted to save enough money to buy a mountain bike at the time, and I still never got that mountain bike. From there I moved my way up. Became a kitchen manager, a sous chef, an executive chef and then finally I ended up leaving that all behind to become a private chef. That’s when I got the idea for The Farmers Dinner. Q. Why did you take a chance in 2012 to found The Farmers Dinner? A. I was doing contract work with an organization called Visualize Nashua, and their project was to basically create ideas within the community. I had this idea of doing dinners based off just purely local ingredients to honor some of these great farmers. So I spent some time with the farmers, pitched the idea and then the community voted on it. It became one of the events that they really wanted to see happen. In 2012, we worked with Saffron Bistro and chef Joe Drift. He took on the project and gave it the big thumbs up, and we had our first farmers dinner, with the format that is still tried and true today. We have farmers speak in between courses, talking about stories they have on the farm. Q. How far does the non-New Hampshire food we eat travel before getting here? A. The average meal travels over 1,500 miles before it reaches your plate. When I saw that statistic originally, I was baffled. It bothered me, and I think it was one of the catalysts for trying to track our mileage for the farmers dinner. Our ingredients travel, on average, about 50 to 70 miles. Q. What exactly is The Farmers Dinner? A. We work with local farms within about a 50-mile area from the location where we are hosting the dinner. We go to these farms, hang out with the farmers and get to know them, which helps us to understand what they do and why they do certain practices. And then we bring that experience to the dinner. Our tagline is, “A story in every bite.” We want people to understand that behind those bites lie stories that are rooted deep in the fields of these farmers. So we create a community-based setting where you get to meet your farmer, have exceptional food prepared at a high standard and really have a moment where you come back to the farm and meet the people growing your food. We’ve done several outside, and they’re always majestic. We’re going to be doing a lot more outside. Q. How has this farm-to-table movement benefited New Hampshire Farmers? A. Even with our small company, we have been able to give back over $50,000 to the pockets of local farmers. We’ve taken on a series of small farms, and we’ve pledged to purchase from them and to help promote them. They’ve been able to continue their farm, pay their bills – things of that nature. And now a lot of fantastic restaurants sourcing locally. You think of the New Hampshire farm-to-restaurant connection and what Charlie Burke has been able to do there. This has the given light to a lot of these small farms. Restaurants are now pledging to buy from them, creating their own microeconomy in allowing these farms to flourish. Q. How did you initially connect with these farmers to get them involved? A. I showed up with muck boots and some gloves and said, “I’m here to work and volunteer.” Carl Hills from Kimball Fruit Farm really took the first chance on us. We said we had this concept we wanted to do. He said, “OK. We’re on board. We think that you have a good idea.” From then on, Carl and I had a very special relationship, even to this day. For us, it’s first and foremost about the farmers. We want to make sure that their message is getting across and we want our clients to go to the farm and see what it’s all about. Q. How does New Hampshire rank in comparison to other states hosting similar dinners? 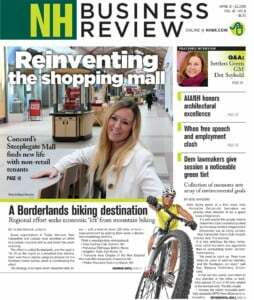 A. I think that New Hampshire is slowly getting there when it comes to local and farm-to-table. You think of places like Vermont, which has really spearheaded this in the nation. California has always been very hip to it. New Hampshire has embraced it. I think that the Agriculture Department has really taken time to put resources into it. We have a lot of work to do in the industry, to be able to understand why a tomato grown in California labeled “organic,” then shipped to New Hampshire, is not necessarily organic because of the 3,500-mile carbon footprint. And why a tomato grown and picked when it’s green and then ripened with ethylene gas and then put in a grocery store is not the same fundamental product as a tomato grown right here, a few miles away. Q. Sometimes your meals have a theme, like the fundraiser, “Vintage,” the dinner you put on at the Nashua Senior Activity Center. People should expect the unexpected and then be pleasantly surprised. A. Absolutely. We want to push the envelope. A glimpse inside the farmers dinner is this: When we call, for instance, Miles Smith Farm, the way that we plan a menu is we call Theresa, who does all the shipping and receiving, and we’ll say, “What do you have too much of right now?” The reason we start the conversation that way is because any time they can’t move product, they’re actually losing money on that product. It’s sitting in their freezer and not able to move. A lot of chefs want prime cuts, right? Your rib eye, your tenderloin and your filet. We’ve never used those products. The reason is we believe there is fantastic food out of some of these other cuts of meat. The brisket that goes unused, and things of that nature. We want to be able to expect the unexpected and give someone an amazing experience while honoring the farm. Q. How do these meals become social gatherings? They almost seem like community dinner gatherings from the 1800s. A. When we started the dinner, the first decision that we had to make was how were we going to set up the dining room. I made the decision very early on that I did not want reservations to sit together. If you have a party of six, we will put those six seats aside. But the chances are we’re going to have a long table and that long table is going to be made specifically so that you can commune with other diners. We have had people meet and become best friends at farmers dinners. We’ve had couples come and meet other couples. We do this on purpose because we want to bring back the ideology of breaking bread with your neighbor. Q. It’s all about connecting farmers with diners, right? A. For us, part of the paramount experience of a farmers dinner is getting to meet your farmer. We work with over 31 farms in this state. Because of that, you’re going to have different stories and different ideologies of how to raise certain crops and things of that nature. We want the diners to be able to look at and shake the hand of the person who’s growing their food. That’s an important connection that so many of us have lost because we go to the grocery store and we pick up this Styrofoam container filled with meat without bones and without blood. We lose the connection that it was an actual living thing. And even the produce that we work with is picked by hand with really hard-working people in the hot sun. We want to thank them and honor them and we want you to have that experience as well.